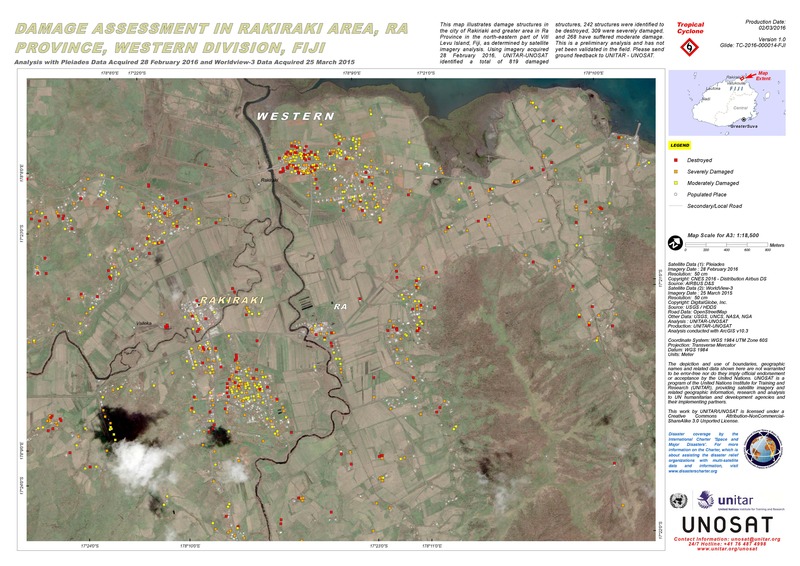 This map illustrates damage structures in the city of Rakiriaki and greater area in Ra Province in the north-eastern part of Viti Levu Island, Fiji, as determined by satellite imagery analysis. Using imagery acquired 28 February 2016, UNITAR-UNOSAT identified a total of 819 damaged structures, 242 structures were identified to be destroyed, 309 were severely damaged, and 268 have suffered moderate damage. This is a preliminary analysis and has not yet been validated in the field. Please send ground feedback to UNITAR - UNOSAT.